For the river in England, see River Lea and Lee Navigation. For the river in Germany, see Lee (Vechte). Not to be confused with Lees River. A hydro-electric scheme was built on the river, upstream from Cork City, and this part of the river now contains the Carrigadrohid and Inniscarra reservoirs. The river is crossed by 42 bridges, 29 of which are in Cork City, and one tunnel. The river also provides an 8 kilometres (5.0 mi) stretch of salmon fishing. Ptolemy's Geography (2nd century AD) described a river called Δαβρωνα (Dabrona) or Λαβρωνα (Labrona), which is sometimes considered to refer to the River Lee. Though unconfirmed, the Irish name for the river, Laoi, may derive from Corca Luighe, which in turn derives from 'Luighe', the son of a quasi-mythical Milesian noble. There is also the Λουρ (Lour) which passes through Tralee. The River Lee has its source in the Shehy Mountains near Gougane Barra, where there is a forest park, chapel, hotel, and shop. The Lee flows from the lake of Gougane Barra as a fast paced torrent, but by the town of Ballingeary it eases and flows into Lough Allua. Departing the lough, running east, it again becomes a rapid flow before running into The Gearagh and Carrigadrohid feeder reservoirs and then into the Inniscarra reservoir created by Inniscarra Dam. Moving on, it flows down from the dam, in normal conditions a gentle river until it comes to Ballincollig Weir in Ballincollig Park; here it is dangerous to swimmers when in high water. The Lee then flows into the city under Inniscarra Bridge and flows parallel to the Carrigrohane road. Along this section gauges monitor the water levels from the Inniscarra Dam. The river flows over the Lee weir and then is split into the north and south channel at a sluice (it historically occupied the city area in a maze of channels). This area is popular for recreation, kayaking and fishing. The two channels join again at the Cork docks and enter the extensive estuary and harbour, south of Glanmire, passing either side of Great Island (Cobh lies on the south coast) to fill the outer harbour, and reaching the open sea between Whitegate and Crosshaven. The upper tributaries of the Lee include the large Sullane River from near Ballyvourney (tributaries include the Foherish and Laney Rivers), the small Buinea and Glashagariff Rivers, the River Dripsey and its tributary the Ryelane, the River Bride from Crookstown via Ovens, and the Shournagh River (formed from the Blarney and Martin Rivers, and the Owennagearagh River; historically may have been the Awbeg River). City area tributaries include the combined Maglin (from Ballincollig) and Curraheen (occasionally Curragheen) Rivers, capturing the Glasheen River also and joining at the western end of the UCC complex, and the Kiln River which joins by the Christy Ring Bridge in the city centre, a little west of St. Patrick's Bridge (formed in turn from another Bride River and the Kilnap or Glennamought River, later joined by the Glen River). 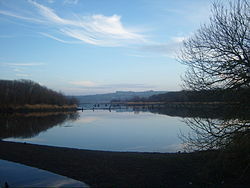 Estuarine tributaries include Glashaboy River, passing Glanmire (main tributaries the Black Brook, Cloghnageshee River and Butterstown River), the Douglas or Tramore River (joined by the Trabeg River as it flows into the Douglas Channel, its estuary) which drains parts of the southern city, Owennacurra River (joined by the Dungurney River at Midleton), and the Owenaboy River almost at the final mouth of the outer Lee estuary (the Liberty Stream joins this river, with significant flows from Cork Airport). Recreation activities on the Lee include sailing, from a sailing club based on Inniscarra lake, where people also swim. There is a kayak club based on the Lee Road. Water skiing also takes place on Inniscarra lake and several rowing clubs are based on the Lee including the "Lee Rowing Club", "Shandon Boat Club" and “Cork Boat Club”. Naomhoga Chorcai is also based on the Marina, and is Ireland's largest Currach (traditional canvas fishing boat) rowing club. Angling is also common from the banks of the Lee Fields. Tidal considerations, combined with low-lying urban developments, and later dam management contribute to repeated flooding events on the Lee. For example, specific streets in Cork city centre have been affected by floods more than 100 times since the mid-19th century. Lower-lying parts of the University College Cork campus were also flooded extensively, resulting in lectures being cancelled throughout the week. There was severe damage to the university's then newly built IT building, the Western Gateway Building, situated next to the river on a known floodplain, where for example a 300-seat auditorium was flooded to near ceiling height. 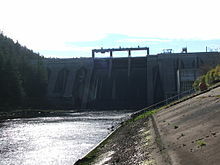 To prevent issues upstream, the ESB made a controversial decision to release water from the Inniscarra hydro-electric dam. This released 535 tonnes of water per second into the already flooded river, raising the flood to 1.5 metres in parts of the city centre. The ESB insisted this was an essential move, and if water had not been released, the flooding would have been much worse. ^ a b "Irishfisheries.com/waterways - River Lee". irishfisheries.com. Archived from the original on 2007-11-17. ^ "An Laoi/River Lee". Logainm.ie. ^ "Ireland" (PDF). Romaneranames.uk. Roman Era Names. Retrieved 1 January 2018. ^ "River Lee Project". CorkHeritage.ie. Retrieved 1 January 2018. ^ John Windele (1910). Cork: Historical and Descriptive Notices of the City of Cork from Its Foundation to the Middle of the 19th Century. Guy and Company. p. 3. ^ "The Office of Public Works". www.opw.ie. ^ "Flooding in Oliver Plunkett Street - Cork Past & Present". www.corkpastandpresent.ie. Wikimedia Commons has media related to River Lee, Cork. This page was last edited on 24 March 2019, at 21:57 (UTC).